She gave me a little gift of the needle minder for being her first customer. I just love it! I will treasure the set always! :) Thank you again Tanya! Tanya's goodies are just beautiful. There is actually a set on her site right how that I really want. :-) Maybe withy my tax refund check. Nicole - yours is one of my fave blogs. How did you take the border off your signature though, while keeping it on your photos. And, sorry about deleting my first comment, but it had a bunch of typos LOL! This is my favourite of all her designs. It's just so beautiful. They are very beautiful. Nice paintings! Oooh, lucky you!! Tanya's painted sets are as beautiful as her blogs are. I'm jonesing to get one, too... maybe next month! Aren't they just so pretty! A very talented lady. Very nice ! I'm off to Etsy to take a look. These are amazing! 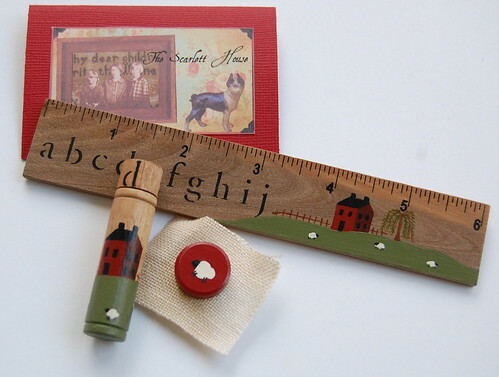 And you're very lucky to received the needle minder - so cute with the sheep! You've got me hooked. I'm going to place an order at some point in the near future. Those designs are so prim cute! wow, that is really cute. you are such an enabler you know that!!!! LOL! Oh my gosh, that is so cute! Lovely! I'll have to visit Tanya's site. Tanya should do really well w/her new Etsy shop. Her pieces are just too cute! Beautiful! Tanya has hands of fairy. How cute are these? I'm off to check out her Etsy shop!